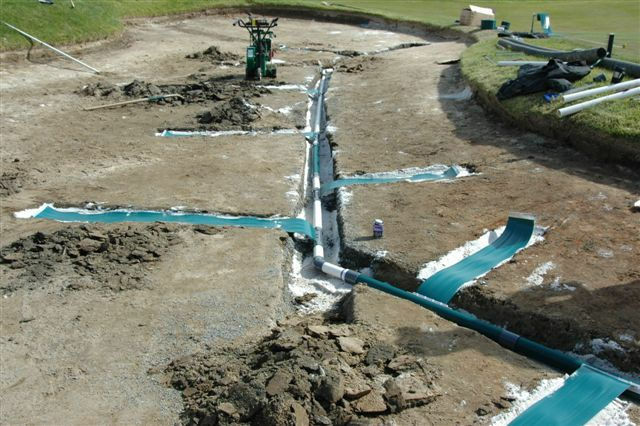 SMART DRAIN� is ideal for golf course drainage. Tees, bunkers, greens, and fairways all can benefit from Smart Drain's patented drainage technology. Nothing is more frustrating for Superintendants than drainage systems that work great for a little while, and then performance starts to degrade until a new system needs to be put in place. Puddles and saturated soil are also devastating for grass, inhibiting growth and drowning it until it dies. SMART DRAIN� , with its revolutionary micro siphon drain channels drains excess water quickly and effectively, with no clogging or diminishing performance over time. SMART DRAIN� is good for turf. Sand is used as the drainage medium, instead of rock or pea gravel, which retains more moisture and does not dry out like rock. 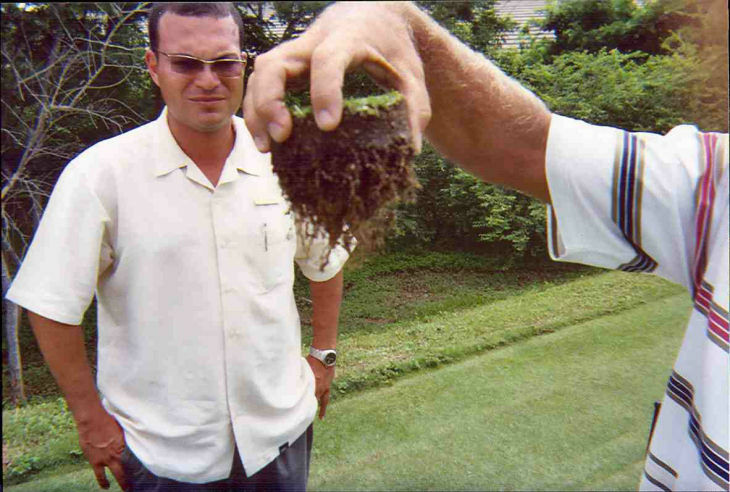 This leaves more water in the soil for turf and plants while, paradoxically, draining faster and more effectively. No more brown spots of dead grass over your drainage lines after a few rainless days. 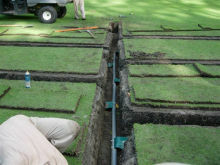 An effective drainage system can really enhance the look and heath of you tee boxes. SMART DRAIN� provides a fast and effective solution for tee's that doesn't require stone aggregate. In this application, SMART DRAIN� can even be embedded right into the drainage mix without additional drainage stone or sand. Since it does not use a filter, it will provide years and years of efficient drainage. Bunkers are a specialty for SMART DRAIN� . Sand also has a capillary action that is complementary to Smart Drain's own capillary action. It literally hands the water off to the SMART DRAIN� belt to be drained. In traditional systems, the drainage rock often becomes filled with sand anyway, negating its usefulness and migrating to the surface becoming a nuisance to players. "No more rocks in your bunkers!"